The older I get the more I am convinced that many of life’s most compelling moments are spontaneous. More exactly, if you keep your mind and eyes open, you’ll experience enjoyable surprises. This morning was one of those times. Walking down Chicago Avenue I saw a man at a bus stop dressed in a full Cubs uniform. I knew right away who it was, and for good reason. 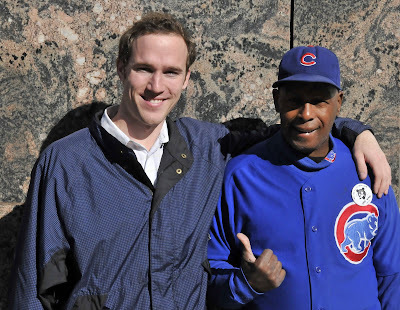 Ronnie “Woo-Woo” Wickers is the only person in Chicago who wears a complete Cubs uniform every day. He told me later that he owns a bunch of them in blue, gray, and white. For those outside of Chicago, let me tell you about Woo-Woo and why I was so happy to run into him. Woo-Woo was born premature on Halloween in 1941, and raised by his grandmother, who took him to Cubs and White Sox games. He had an early affinity for the Cubs. Since 1969 he has gone to virtually every Cubs home game. For many years he worked overnight at Northwestern University as a janitor. He continued to work night jobs so he could go to the Cubs games. The 1980s were difficult for Woo-Woo. His grandmother and girlfriend died, and he was often jobless and homeless. In a May 1985 the Chicago Reader wrote: “Wrigley Field’s most visible fan has no home, no job, no family to speak of, but when the Cubs win he’s happy, and when they lose he’s still happy.” When he missed a few home games during the 1987 season, Cubs fans worried that he might have died. He contacted news organizations saying he was alive and well. In 2005, a documentary film was released about Woo-Woo. Now, nearing his 67th birthday, Woo-Woo has no wife and children. 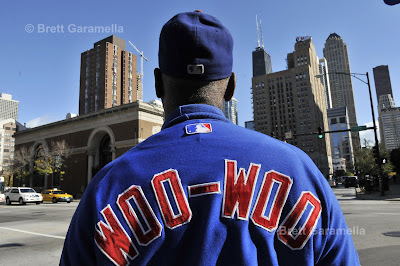 He does have the total love and appreciation of Cubs fans and plans on going to games, and chanting his trademark Woo! like a mating seagull. 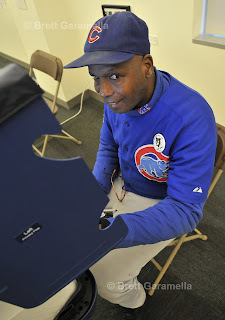 He wears a full Cubs uniform every day, no exceptions. I told my dad about Woo-Woo and he said he wanted a photo of Woo-Woo and me. Coincidently, I was carrying my camera today because I was working on a photo story earlier this morning. I introduced myself to Woo-Woo and explained that I had told my dad I’d get a photo with him. Woo-Woo happily obliged, and I then asked if I could have a photo of just him. “Sure, take as many as you want,” he said. After the photos, I asked him what he was doing. He said he was on his way to vote early, and invited me to tag along. “I’m sorry about the Cubs,” I said. “It’s ok, we’ll get ‘em next year,” Woo-Woo said. He had gone to both home playoff games a few weeks ago. But baseball didn’t seem to be on his mind. He was struggling for money. For a guy who goes to every Cubs home game, job security can be difficult. He says he shovels snow and helps out at birthday parties to earn money in the Major League Baseball off-season, which naturally is his off-season, too. Now we were wandering down the sidewalk, Woo-Woo carrying a small tote bag, looking for the place to vote. He said it was on LaSalle Street, but didn’t have the exact address (LaSalle Street is many, many miles long). He wasn’t scared to ask. As we crossed the street a pretty blond woman stood at an intersection. “Smile honey, your hair is as shiny as the sun,” Woo-Woo said. At first a little self-conscious, she let out a big smile. I couldn’t help but smile, too, watching Woo-Woo wander around asking anyone who he thought might know the polling location. I tried asking Woo-Woo if he had something with the address on it, but he’d just cut me short, “It’s here on LaSalle.” Woo-Woo crossed the street and entered a cell phone store. Two employees, a middle-aged man and young woman, stood behind the counter at the empty store. The man recognized Woo-Woo, and asked him who he was voting for. Moments earlier Woo-Woo confessed he was a registered Democrat. Woo-Woo chanted a mantra that earned him his namesake. Perhaps the man was a Republican. Either way, Woo-Woo was in a good mood and let the three of us know. Black, white, pink, or gray! Woo! Obama is here to stay! Woo! The man behind the counter had pointed out the big red brick building across the street. It was a living center for the disabled, serving as an early polling station. Woo-Woo entered cheering his mantra. “You can’t say that in here,” said a woman working in the lobby. A lady working at the front desk was smiling. Woo-Woo and I took an elevator to the fourth floor, and walked into the polling room. He started his chant again, only this time the polling officials were really serious, and he stopped. They still had their hands full with Woo-Woo. He didn’t have his contacts in. “These might help,” said the man running the polling room as he handed his glasses to Woo-Woo. “You might want to change your terminology,” said the man helping Woo-Woo. The man was patient and good for the job. As we walked out of the lobby Woo-Woo couldn’t resist. The woman sitting at the front desk was still smiling. Manny Being Manny ... or Manipulated?